On the map you can see the location of our premises. If your computer is Google Maps compatible you will see controls on this map. You can pan around the map by clicking and dragging your mouse, or by using the arrow controls. You can zoom in and out using the + and - controls. You can also change to a satellite view, or a hybrid map/satellite view using the buttons. You can close the address box, to open it again click on the orange position marker. 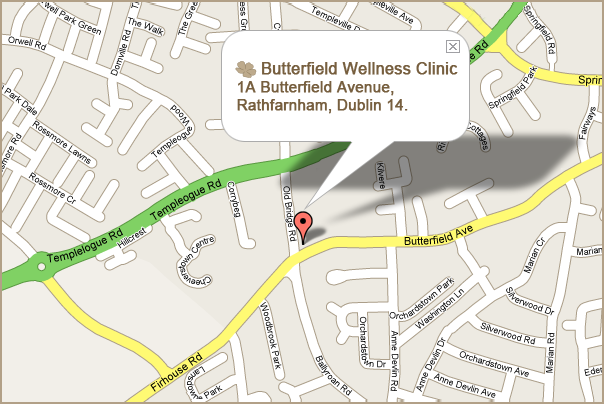 Administration address: Butterfield Wellness Clinic, 1A Butterfield Avenue, Rathfarnham, Dublin 14, Ireland © 2009 Butterfield Wellness Clinic.